Designed by Hannes von Döhren and Christoph Koeberlin in . Published by HVD Fonts. Fabrikat supports up to 83 different languages such as Spanish, English, Portuguese, German, French, Turkish, Italian, Polish, Kurdish (Latin), Azerbaijani (Latin), Romanian, Dutch, Hungarian, Serbian (Latin), Czech, Kazakh (Latin), Swedish, Belarusian (Latin), Croatian, Slovak, Finnish, Danish, Lithuanian, Latvian, Slovenian, Irish, Estonian, Basque, Luxembourgian, and Icelandic in Latin and other scripts. 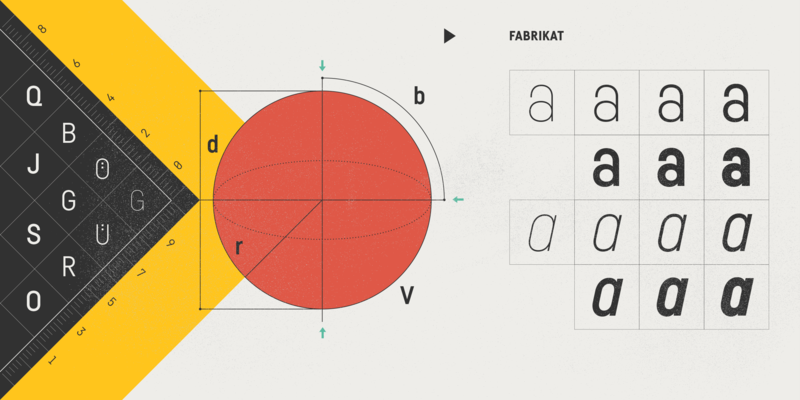 Fabrikat is a perfect example of the straight-sided geometric sans. Compact and workmanlike, the design evokes an air of industrial tradesmen going about their business. Not merely a nostalgia piece, Fabrikat is suited to a broad range of contemporary work, including editorial and general display. The family comes in seven complete weights from Hairline to Black.